Since shark attacks are pretty rare and getting bitten by another person is not so rare (perhaps as of late they are! ), we decided to focus on a more common kind of shark attack, one that most people should learn to protect themselves from as soon as possible: The office shark attack. The office shark, characterized by its power-hungry, super-aggressive, man-eating attitude, is native to absolutely every workplace on earth. It attacks without warning and has been known to bite the head off of anything that gets in its way. To help you survive your inevitable encounter with this beast, EresumeX has put together a handy how-to guide. If you are going to request a change to a new department, try to avoid using the other person being a shark as a reason, though. Hopefully there are other reasons that will put you in a better light. ‘I understand there’s an opening in the such and such department and I have the skills that they seem to be seeking so I think it will be a good fit,’ or something along those lines. 2. Travel in a pack: If there’s no way to avoid the shark at work, at least try to avoid being alone with her. She’ll be less likely to attack in front of a group. Plus, you’re probably not the only who feels bullied by the shark, so it should be easy to form an alliance against her. Most likely, the shark is a shark by nature – not just with you. Talk to others and find allies. 3. Stay alert: When the shark is around, don’t let your guard down. Keep personal and professional information to yourself, since the shark may try to use it against you later. 4. Don’t panic: Office sharks, too, can smell fear. They prey on the weak, so a confident attitude will keep them away. Sharks don’t show aggression right away. Only when they feel that they can get away with it – that the person in front of them lacks confidence – do they step it up from provocative to disrespectful to aggressive. If you are around a shark-kind-of-a-person, send an early message that this is not okay. 5. Defend yourself: According to the Discovery Channel’s shark facts, punching a shark in the nose or poking its eyes can help to fend it off during an attack. Aim for the sensitive eyes or gills – or, if your aim is off, the much bigger target of the snout. 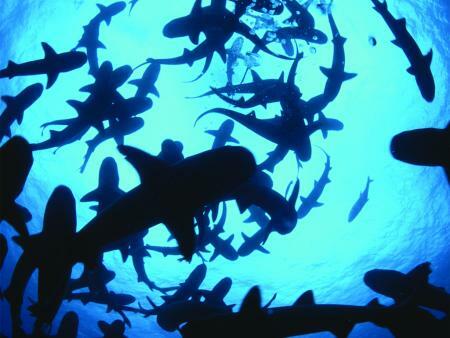 Most sharks don’t want to work that hard for their food and will swim away. This same strategy will work for the shark in your office. Next time he messes with you – BAM! – whack him in the nose. Just kidding. However, like we mentioned before, sharks pick on the little guys because they can. Put up a bigger fight and chances are he’ll walk away. Next time the shark tries to overpower your opinion, for example, make sure that you’re heard by using this tactic: Express your disagreement – but don’t explain yourself unless follow-up questions are asked. If you have a different opinion, don’t say things like ‘Could you listen, please,’ etc. Just continue to say ‘no,’ ‘I disagree,’ ‘not how I view it,’ etc. until the other person stops and asks you why. 6. Size him up: If you’re no match for the shark, be careful about how you approach him. There are some sharks who will fire you, if it is their company, just because you stand up to them and they want to show you who is in charge. That doesn’t mean you don’t stand up to him or her, but be prepared for that outcome. That means that you have your resume ‘dusted off’ and you’ve thought through if you absolutely have a financial cushion or even another family member who is working so if you do lose your job, you won’t be out on the street. 7. Get the heck out of there: If you find yourself in an organization that tolerates dysfunctional behaviors — well, maybe this is not the place to be. Know your choices. Sometimes it’s just that simple.